Los Angeles, Calif., Jun 29, 2018 / 04:48 pm (CNA/EWTN News).- At a Mass in honor of immigrants on June 24, Archbishop Jose Gomez of the Archdiocese of Los Angeles called on Catholics to pray for immigrant families, to speak out against injustice and to demand better solutions from their legislators. “For years now, we have been asking our leaders to fix our broken immigration system. Year after year, they keep telling us, ‘Mañana, mañana.’ Next year. It makes no difference which political party is in power, there is always some excuse,” he said. Gomez gave his remarks during his homily on Sunday, June 24 at the annual Mass in Recognition of All Immigrants at the Cathedral of Our Lady of the Angels in Los Angeles, which was attended by about 3,000 people from throughout California. The Mass came just days after President Donald Trump signed an executive order on June 20 entitled “Affording Congress an Opportunity to Address Family Separation,” intended to end the practice of separating children from their parents at the U.S. border while maintaining the Trump Administration’s “zero tolerance” policy illegal entry into the United States. The executive order said that detained families will be held together, “where appropriate and consistent with law and available resources.” It came after weeks of widespread criticism and public outcry over the separation of families at the border, due a policy that limited the amount of time children could be detained by the government, and the administration’s decision to prosecute illegal border crossings criminally. Gomez said in a Tweet on June 20 that he welcomed the executive order, and urged Congress to act on bipartisan reform. In his homily on June 24, Gomez again voiced his support for a bipartisan immigration reform bill, and urged Catholics to call their legislators. Catholics are called to speak out against injustices towards immigrants, Gomez said, because they are also a part of God’s family. “In the Church, we are God’s people, his family. And he gives us the duty to take care of one another. He calls us to speak out against injustice, to make things right when they are wrong,” he said. He also urged Catholics to pray for the families who have been separated, that they may be reunited quickly. “We need to pray today for those little ones and their parents. And especially we need to pray for our politicians and for all citizens of goodwill. May all of us open our hearts to the voice of God…” he said. 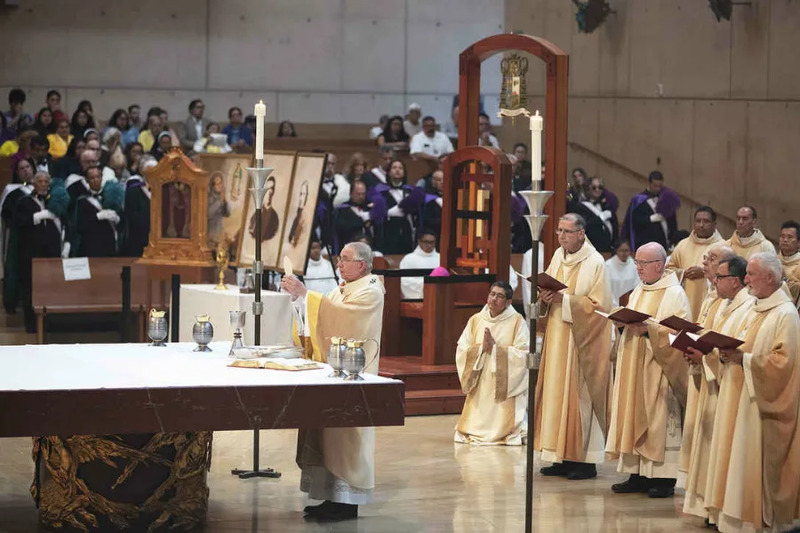 Attendees of the immigration Mass also had a chance to venerate the relics of St. Junípero Serra, St. Frances Xavier Cabrini and St. Toribio Romo, and to write prayer intentions that Gomez will bring to the Basilica of Our Lady of Guadalupe in July. The archdiocese has also started a social media campaign with the hashtag #PrayForImmigrants, so that Catholics can show their support for immigrants. Gomez closed his homily by invoking the intercession of St. John the Baptist on his feast day, and that of the Blessed Virgin Mary. “Let us ask St. John the Baptist to help us to follow his example in proclaiming the love and mercy of God in these times when so many people feel angry and afraid,” he said. “And let us keep working for a new spirit of compassion and love — especially for the weakest and most vulnerable among us,” he added. Next Juveniles Stuck in the Justice System: How Can the Church Respond?